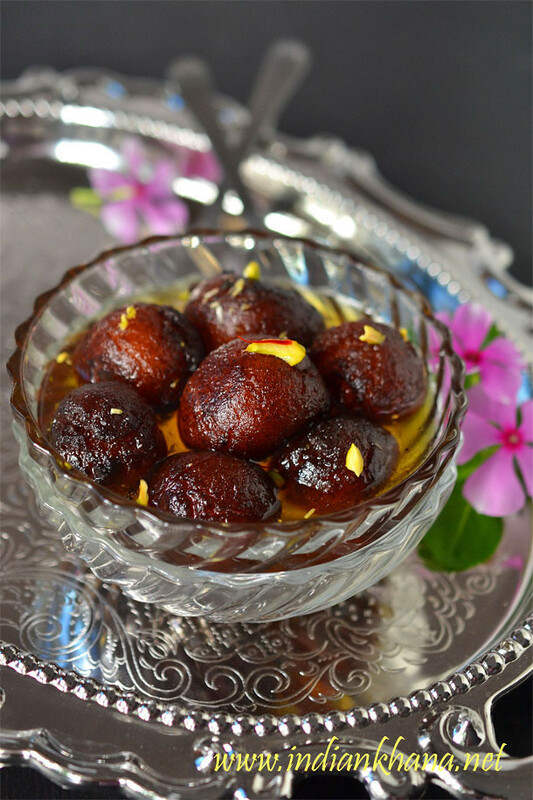 Who doesn't like some soft Gulab Jamun for Diwali ofcourse this yummy sweet is not restricted to Diwali only and we make this whether it's any special occasion or not. I made these Chocolate Gulab Jamun for DH Birthday and as he likes chocolate a lot so along with chocolate triple cake I made these choco jamun and of course he loved the choco surprise. It's nice when people think it's regular jamun and there you have a chocolate surprise, what more to ask for right? 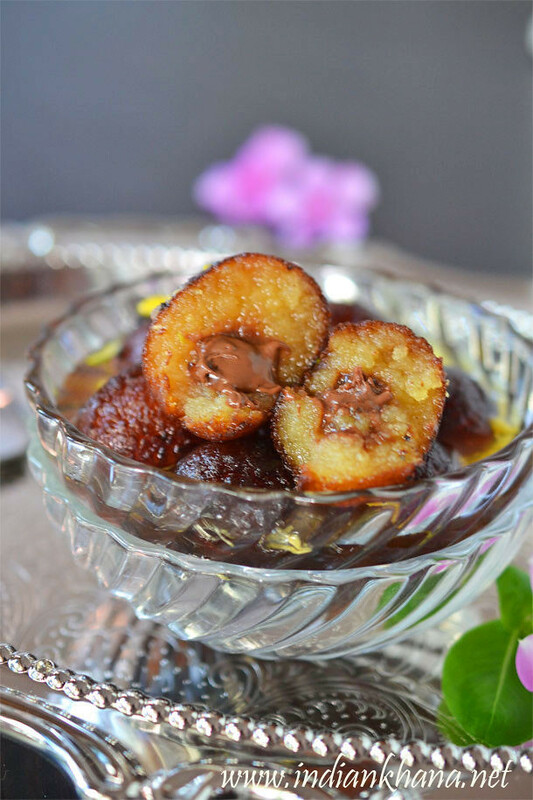 If you have Diwali party at home then try this chocolate jamuns to have a twist than the regular jamun. You can also do half and half ie do half regular jamuns and other half stuff with chocolate it will be fun right? Do share how you liked this recipe. 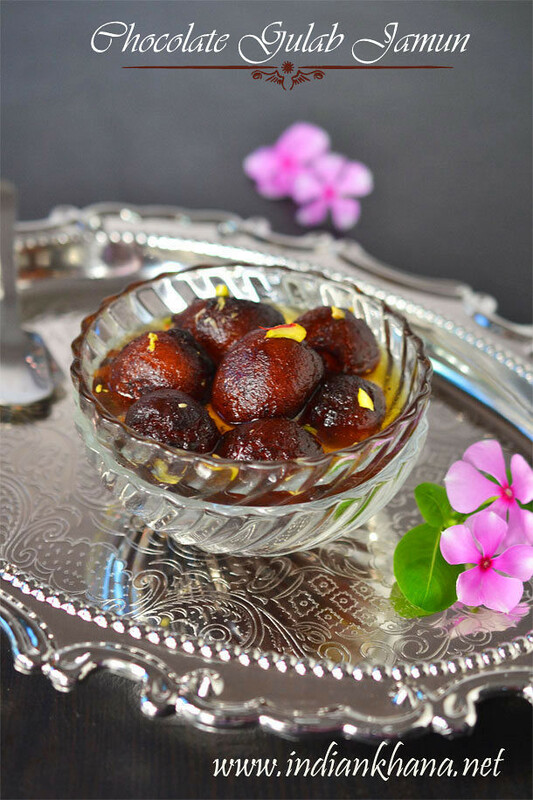 Rich, delicious popular Gulab Jamun with Chocolate surprise recipe with step by step pictures. Prepare sugar syrup for that in a large vessel or pan add sugar, water and bring it good boil. Add cardamom powder, saffron strands, rose or kewra water if using and keep boiling until syrup starts to get thicken and we get 1 thread/string consistency around 10-12 mins in medium flame, remove any scum and off flame. If you are using frozen khoya, bring it to room temperature. In a bowl add khoya and crumb it. Add maida, cardamom powder, baking powder and combine well. You may need more or less maida depends on your khoya texture, if the khoya is very soft you may need more maida. Make smooth and firm dough. Heat oil or ghee in kadai or wok for deep frying and meanwhile divide dough into equal portion, make small balls and stuff with small (smaller than you see in step wise pic as I chopped chocolate further later) chopped chocolate pieces or chocolate chips, make smooth round (balls) without any cracks. Don't apply pressure while making balls. Once oil is hot add 5-6 jamuns and fry in slow flame until golden brown. Keep stirring the jamun in intervals to even frying. Drain in kitchen towel immediately drop them into the warm sugar syrup. Make sure sugar syrup is warm or little hot. Allow jamuns to soak 3-4 hours or overnight. Garnish with dry fruits. 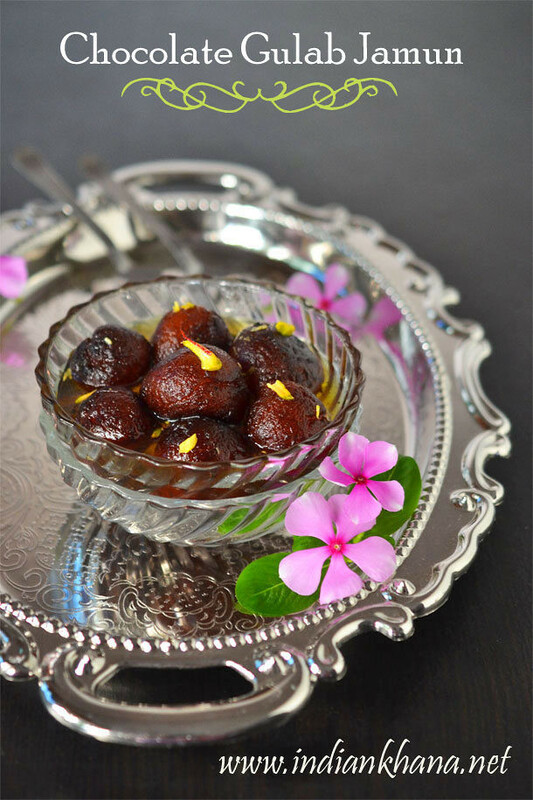 Serve warm or cold, enjoy these melt in mouth gulab jamun with chocolate surprise. If you are using frozen khoya, thaw it first. Chop chocolate into small pieces so it's easy to roll jamuns after stuffing, I chopped later in to further small pieces. You can do same chocolate jamuns using milk powder too, for that use my milk powder gulab jamun recipe and do chocolate stuffing. You can also make this using instant gulab jamun mix. Don't drop jamuns into very hot oil or it will get dark brown without cooking inside. 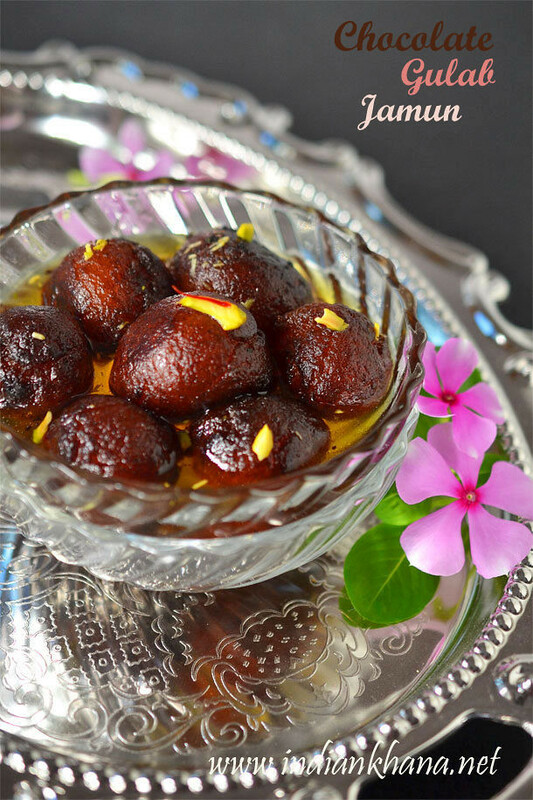 Popular and delicious Gulab Jamun for Diwali or to make any festival special.